These heavenly Peanut Butter Chocolate Chip Streusel Muffins are reminiscent of treats found at your local coffee shop. They’re so good, so make a batch to impress your loved ones this weekend. I don’t know about you, but I am SO ready for fall. I’m ready for all things pumpkin, falling leaves, crisp 50 degree morning runs, and curling up under cozy blankets. I recently heard that Pumpkin Spice Lattes will be at Starbucks really early this year–August 25 in some places. That, to me, is crazy. Summer’s still happening outdoor! While I won’t be loading up on PSLs [I’ll probably have 1-2 over the course of the season and then make some pumpkin spice syrup to enjoy with my coffee at home.] I can’t wait to bake up lots of yummy muffins to enjoy this fall. I do make muffins year round, but there’s something special about warm muffins with your coffee in the fall. 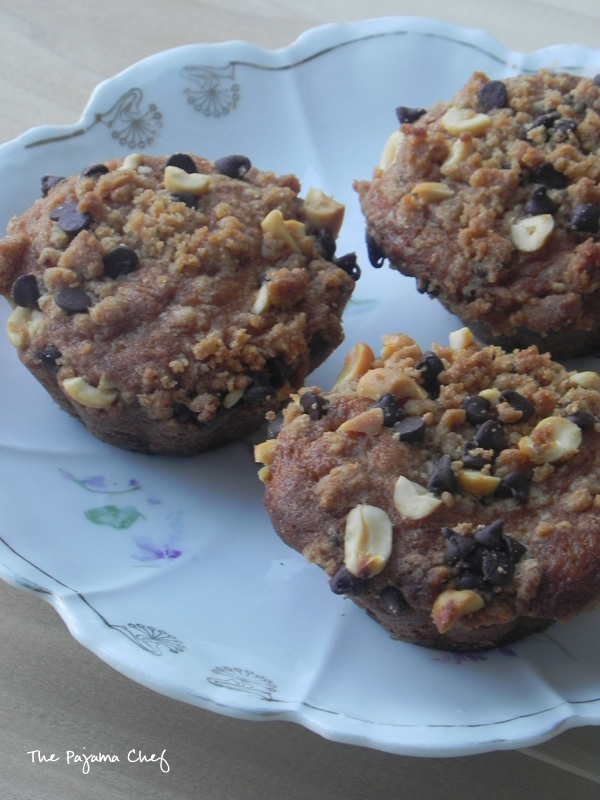 These bakery-perfect muffins combine two of my favorite things: peanut butter and chocolate. 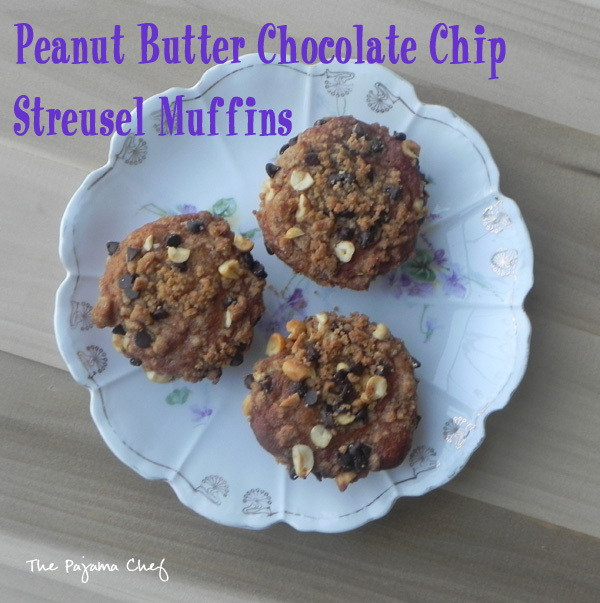 And the best part is that the peanut butter and chocolate are DOUBLED in this recipe… you’ll find them in both the muffin itself AND in the streusel. It’s double the love, y’all. 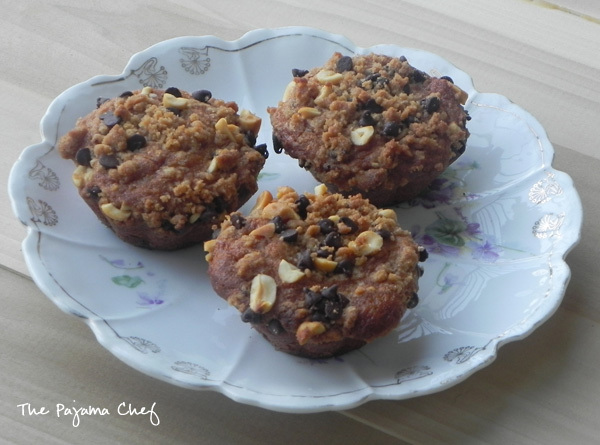 I hope you’ll love these easy muffins just as much as we did! Heat oven to 375 degrees. Line a muffin pan with paper liners or grease with cooking spray. In a small bowl, prepare streusel by combining 1/4 cup flour with 1/4 cup brown sugar. Use a pastry blender or two knives to cut in 1 tablespoon butter and 2 tablespoons peanut butter. Stir in peanuts and chocolate chips then set aside. In a large bowl, beat together remaining butter and peanut butter for about 30 seconds or until combined. Add 1/2 cup of remaining flour, the rest of the brown sugar, half the milk, the egg, baking powder, and baking soda. Beat on low until combined, then add remaining flour and milk, mixing until combined. Stir in remaining chocolate. Divide batter between muffin cups, filling about 2/3 full. Sprinkle with streusel topping then bake for 20-25 minutes or until toothpick inserted in the center comes out clean. Cool in the pan for 5 minutes then remove to wire rack to cool completely. Bring on fall! I wish I had one of these muffins for breakfast! Yes yes yes to everything about these muffins!! Yum!! Also I couldn’t agree more about the PSLs – just wait until September, Starbucks!! You can’t got wrong with the one two punch of peanut butter and chocolate. And in my book you can’t go wrong with a muffin either! I can’t resist anything with streusal in. Unfortunately my husband hates peanut butter! These sound soooo amazingly yummy! I cannot wait to try them out! Looks so yummy. I am definitely pinning it and saving it for later. Thank you for sharing. I am definitely ready for fall! These muffins look great, full of my two favorite flavors (pb & choc)! Ooh, these muffins sound fantastic! I love the combination of chocolate and peanut butter – you just can’t go wrong with that combination! I am soooo ready for fall. I’m completely over the heat. I want cool, crisp air and boots and scarves and fall baking and cooking!!! Mmm peanut butter and chocolate! !